The lifeguard training class includes comprehensive training in water rescues, CPR/AED for the Professional Rescuer and first aid skills. Complete the required Online Course before the first day of class. Pass the final skills scenarios. Successfully pass final written exam with a minimum grade of 80%. How old do I have to be to attending Lifeguard Training? 15 years older on the last class date. 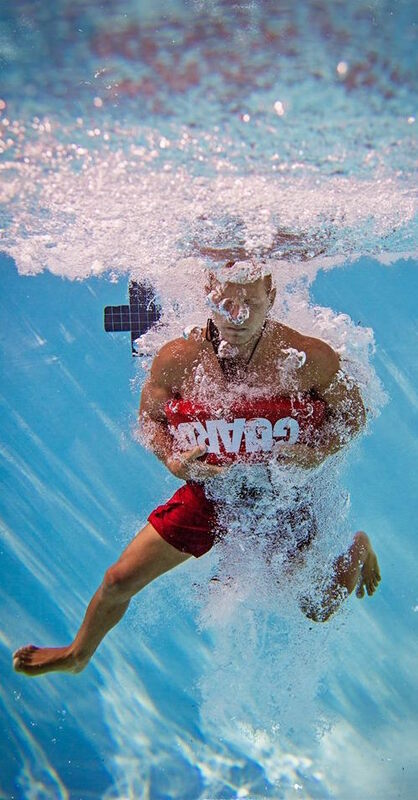 To become a lifeguard, do I have to have to be a perfect swimmer? No. You must however be able to swim 300 yards (12 lengths of a 25 yard pool) without stopping using front crawl or breaststroke, tread water for 2 minutes using legs only, and retrieve a 10-lb weight from 7 feet deep and swim 20 yards with the weight, using legs only and exit the water without using a ladder or steps within 1 minute 40 seconds. In general the most difficult part of the swim test is the brick and we STRONGLY suggest that you practice with a 10-lb hand weight before you take training. What if I already have CPR and/or First Aid certification do I need to attend that part of the class? Yes, none of the training is optional and the Red Cross does not separate the certifications. Is there a Lunch Break? Yes, there will be a 1 hour lunch break each day of training with several near by restaurants with in 5 minute walking distance. Class Transfers – The class transfer fee is $45 and registered participants are required to submit a Transfer Request online at least 48 hours prior to the original class date. Training must be completed within 60 days of the original class date.